In addition to Randall Jarrell, my other discovery* of this Increasingly-Inaccurately-Named Accidental Poetry Month™ has been John Hollander. I've mentioned browsed two of his anthologies (Committed to Memory, which is online (follow the links), and The Gazer's Spirit, which led me to this month's first Jarrell poem), and then -- reading in his anthologies having led me to read his poetry -- posted one of his poems from his Oulipian work Powers of Thirteen. My next step was to the library -- which, in this case, was useless. So my next step was to order two of his books, which just arrived. One was his Selected Poetry (1993) -- which in addition to having samples from many of his books, has his Oulipian book Powers of Thirteen included in its entirety. But that I haven't yet had time to even dip into. The other book of his which I ordered was one of the books which was not excerpted in Selected Poetry, but which I nevertheless was distinctly interested in reading: a book of concrete poetry he wrote called Types of Shape (the "new, expanded edition" of 1991). 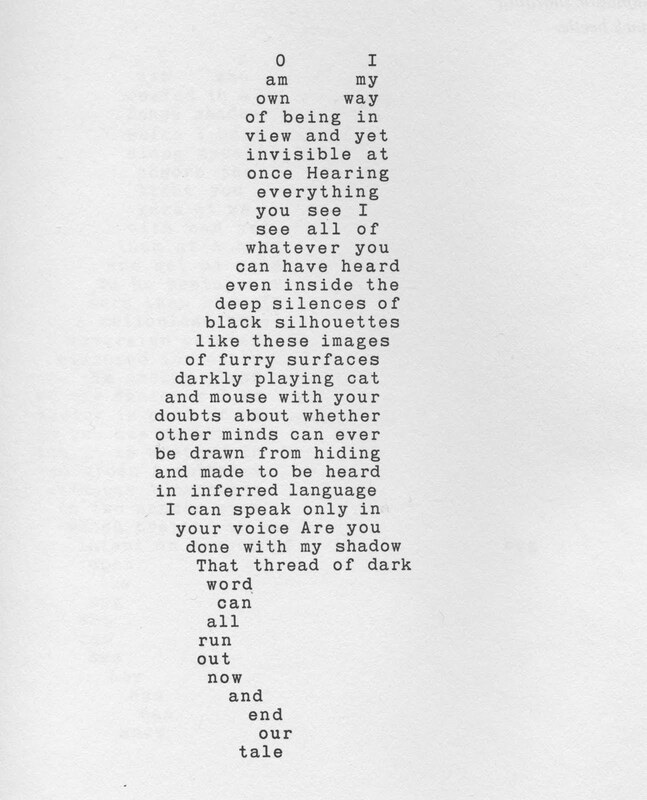 Concrete poetry is poetry whose visual shape on the page is a crucial part of the poem. ** The most famous shaped poem in the language (as Hollander notes in his introduction) is The Mouse's Tale from Alice in Wonderland. I hadn't read much of it before, but I was interested to see what Hollander did with it. Well, as I said, I just got the book, and normally I'd wait a little while longer before posting any of it; but since Accidental Poetry Month™ is rushing to a close, I decided that I'd go ahead and post my two preliminary favorites -- chosen, note, before I've even read the entire book through (despite its including only 35 poems!). Maybe I'll like others more. But I definitely do like these -- more than enough to post them. What I like about this -- indeed, about both of these -- is that they really work as poetry: the language is rich and interesting, and what is said is interesting too. Which is to say, it's not just about the form: it's also just plain good verse. Do click through to see larger versions, by the way: the shapes are cute, but the words are actually worth reading -- and they're much more legible at the larger size. I'll try to get around to reviewing the book properly once I've gotten around to reading it properly. But these instant discoveries seemed to me -- wonderful as they are -- things I was happy to post at once. Coming tomorrow: the climactic (or decidedly anti-climactic) final entry in Accidental Poetry Month™! Stay tuned! * In a I've-heard-of-him-and-even-read-a-book-of-his-without-remembering-his-name sort of way; the book I'd read (or read in) in Hollander's case being Rhyme's Reason. ** The difficulty in laying it out, and the amount of sheer page space they require, are presumably two of the reasons why Types of Shape was not excerpted in the 1993 Selected Poetry -- along, perhaps, with the fact that a new edition had just recently come out. And now here's a third helping of Randall Jarrell, who I've already posted three poems by this month. I said in one of my earlier posts that I was seriously reading Randall Jarrell for the first time this month, but that is, in fact, not quite right: there is one book of his I'd read many times over: one of his children's books, The Bat Poet. I hadn't remembered, prior to my recent explorations, that Jarrell was its author (I knew it was a famous-but-not-all-that-famous poet, but no more); but the book itself I remember extremely well from multiple readings during my childhood. I will definitely read to my son when he's old enough. And all the shadows are as bright as moonlight. The birds begin to sing with all their might. The world awakens and forgets the night. 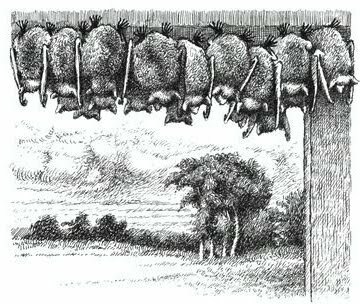 But when he'd got this far the other bats just couldn't keep quiet any longer. "The sun hurts," said one. "It hurts like getting something in your eyes. That's right," said another. "And shadows are black -- how can a shadow be bright?" Another one said: "What's green-and-gold-and-blue? When you say things like that we don't know what you mean." "And it's just not real," the first one said. "When the sun rises the world goes to sleep." "But go on," said one of the others. "We didn't mean to interrupt you." The entire work is fabulous, and I recommend it unreservedly. That final line is just stunning, summing up something deep and important and true in a few perfect words. Poor Isaiah Berlin is remembered for just one sentence -- "The fox knows many things, but the hedgehog knows one big thing". And he didn't even say it! I've mentioned before that I like comparing translations -- indeed, I've done two such posts recently. In this case, however, it's different for me, because I can actually read the original. * At the same time, it's foreign enough for me that I really appreciate a good translation as well. So in a lot of ways this is, for me, a multiple treat -- the original reflecting on the translations, and then vice-versa, each increasing the pleasure in the other. I was trying to think of how to order the translations -- most to least favorite, or vice-versa? -- when I realized that I couldn't decide which I liked best, either. So I'm going to present them in rather random order here. First up is a translation which I found in a book called Selected Poems From Les Fleurs du Mal: a Bilingual Edition, which has "English renderings" by Norman R. Shapiro, and well as engravings by David Schorr and a forward by Willis Barnstone (which may have been what drew my attention to the book in the first place). Behind their boats, plying the bitter deep. Like two oars, trailing useless by their side. Comic, and ugly! He, so fair of late! Some ape the esrtwhile flier's limping gait. When exiled from his heights to earth below. How droll he seems, who late was all grace! And finally a translation by A. Z. Foreman, who I've already posted translations by twice this month, and whose site was one of the things that lead me to go so crazy with poetry this particular March. Behind the ship that skims the bitter deep. And drag pathetically at either side. That sky-rider: how gawky now, how meek! How droll and ugly he that shone on high! Then limp to mock this cripple born to fly. He cannot walk beneath the weight of wings. If you click this link, you can hear Foreman read the original French. There are a lot of other translations too -- this site has five more, for example -- but those three are definitely my favorites among the ones I've come across. * Yes, I can. My French is too poor to read any random text without much trouble; but when I've read the text enough times, then I get it. I must admit that those two poems, read in sequence, just reinforces something I had long thought: that I don't quite see what the deal is about this particular poem. It's not that I don't like Pound at all -- this, for instance, is a great poem (although not one whose view I agree with, and which is all the more disturbing given where that view ultimately lead Pound to go, politically). 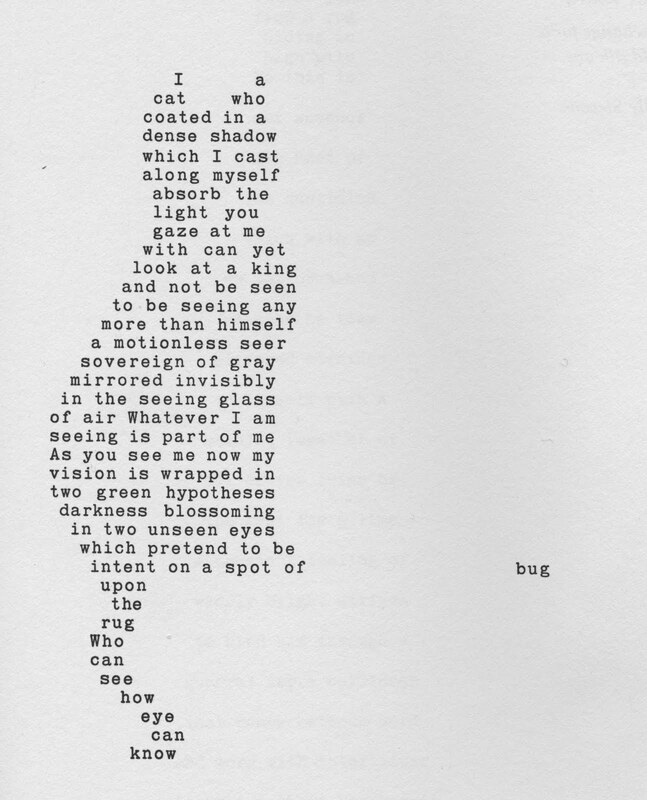 I just never thought this quintessential "imagist" poem was all that much. Reading those two hokku, it seems even less special, since it seems that Pound was walking (however well) oft-trod ground. Petals       on a wet, black    bough. Stunning. At least for me, it was almost a revelation: a whole new poem. The adding of the spaces, the forced pauses, the breath of the page, brought what had been, for me, a fairly flat two-line image to life. So I looked around. Most reprintings seem to have ordinary (flat, dull) spacing, but this web site reproduced almost the precise same spacing as did Isaak (the difference being that at the end of both lines they put extra spacing between the final letter and the punctuation mark too). -- So Isaak was right -- except insofar as the web site editors were right, and there was, indeed, space before each closing punctuation mark, too. Ellis does quote the original, white-space bejeweled version of the poem -- although he quotes it without any punctuation mark in the first line -- not, in an article specifically about the punctuation of the poem, a reassuring sign about his accuracy (perhaps the reproducing web site is at fault here? I can't think of another charitable explanation.) But setting that concern aside, Ellis reports that Pound reproduced this version precisely once, in another magazine -- but that subsequent reprintings of the poem (and, indeed, in one that came between the two space-inclusive versions as well) he omitted those spaces. There was a coma added, and then removed again, after "petals", in various versions; but the spaces never reappeared. The final and most important change Pound had made to the punctuation... [T]his alteration makes the relationship between the two lines appreciably more subtle and suggestive than was previously the case: the colon tended to subordinate the first line to the second by indicating that by itself line one was incomplete, its function being primarily that of introducing the "Image" in line two which the colon informs us is necessary to complete the first line’s meaning. With the semi-colon the first line is, so to speak, less definitely a "prologue" to the second, the linkage between the two lines being insisted on less emphatically. The relationship between them can be said to be not only more subtle but even more equivocal, and the cost of not foregrounding the "Image" is the possibility, as some of my sample readings indicate, that the semi-colon assists the first line in overturning its subordinate position and becoming foregrounded itself. I can see Ellis's point about why the semi-colon is better, although the colons in the other hokku Pound quoted would seem to argue the other way -- if, indeed, the colon is traditional in the form. (Do they have colons/semi-colons in Japanese? Or, rather, did they when Pound was writing? I haven't the foggiest idea.) At any rate, I would certainly argue against that being the "most important change": I think the most important change was his decision -- his quite unfortunate decision -- to give up those spaces. Which, for me at least, made the poem. Yet it does seem -- assuming that our doubt about Ellis's reliability doesn't come to anything -- that Pound himself gave the spaces up. And it's his poem, alas, so I suppose they're gone. Although Auden revised many of his poems in versions that most poetry lovers simply ignore --- indeed, he cut from his "complete poems" one of his very best poems, which most Auden fans (I among them) count among their favorites. If we reject Auden's revisions, why not Pound's? But I don't think Ellis is right about the semi-colon; there's no question, certainly, that I would trade the semi-colon (however much it adds) for the spaces. If that's the trade -- original versus final -- then I'd go with the original. Petals       on a wet, black    bough  . Maybe Pound didn't write that. But if it's a better poem then the almost-identical two he wrote, do we care? A complex philosophical question, that, and quite possibly not one with a determinate answer. For my own part, however, that is the version of this cluster of nearly-identical poems that I like the best; and the one that I will most often reread in my own memory. In contrast to most of the poems I've posted during Accidental Poetry Month™ (although not, to be sure, all of them) this is a poem I've known (indeed, known by heart (not hard)) for years. Sadly, I rarely remember its author (doing the poor fellow no justice), but his name is Frank Sidgwick, and you can find more about him in this obituary here -- hosted by (somewhat randomly) the site of The Baker Street Irregulars, since Sidgwick apparently is also the author of what they describe as a "groundbreaking essay" in the form of an open letter to Dr. Watson. Who knew. I first read this poem in the introduction to an anthology called something like The Sonnet, but it was originally collected in a 1921 book of Frank Sidgwick's poems called More Verse; you'll find it there on page 47. I don't have the book handy, so I might be wrong; but my memory is that the anthology where I originally read this poem quotes it only in the introduction, and says that it is "clearly intended to be a sonnet" -- far too much hesitation, as it happens, since in More Verse it's published as the second of a little collection called "Two Sonnets": Sidgiwck meant it as a sonnet, tout court, and I think he's not wrong to consider it such. I'd quote the other of the pair, but frankly it's not nearly as charming as "The Aeronaut to His Lady" -- not nearly as charming as it's trying to be. If you want to read it, click through to the book and have a look for yourself; but I wouldn't particularly recommend it. Sidgwick's Aeronaut, on the other hand, is a keeper. Today is the 100th anniversary of the Triangle Shirtwaist Factory Fire: you can read about it here, talk about it in this thread, or listen to a good radio report from today's Democracy Now! here. In brief, a sweatshop factor in New York caught fire; 146 people, mostly poor immigrant women, died. The deaths were caused in large part by the fact that exit doors were chained, on the theory that workers would otherwise steal from their employer. In other words: women burned to death in a building because they'd been locked in by their employer. It was a major scandal at the time, leading to a lot of reforms; a lot of the fire codes you see can be traced back to the Triangle fire. But what struck me today, listening to the Democracy Now! report while driving to work, was the detail that some of the women leapt to their death from where they were trapped on the 10th floor. While all the murders of 9/11 were equally criminal, I must admit that the ones that touched me the most emotionally -- tied, I suppose, with the deaths of the firemen who raced into the building to help those inside and died -- were those who leapt to their death from the top of the World Trade Center. Something about the sheer horror of that act was incredibly palpable; the images of those falling bodies, shown on TV, were among the most horrifying of all those shown in that horrifying time. And I suspect I wasn't the only one for whom those deaths helped symbolize the sheer, unthinkable evil that would cause such a thing. Well, it's worth remembering that it's not only murderous religious/political ideologies that can do that. Other things can too. It would be nice and simple to chalk it up to the greed of the owners of the factory; but while they were fully morally culpable, their reform would not have solved the issue: as long as such a practice was legal, any given virtuous capitalist will simply be driven out of business by a less virtuous one. No, what caused those deaths were the evils of unregulated capitalism -- that, when not held back by law, will burn women and children to death if there's profit in it. And, of course, law is not enough: to sustain those laws, we need political counterweights to the ever-increasing power of money in our politics. We need organizations who fight for the poor -- or, rather, which enable the poor to fight for themselves. What the women of the Triangle Shirtwaist Factory needed was a union. Laws to regulate capital, and unions to balance its political power: or a foe ever bit as evil in its deeds (albeit not in its motives) as any other we face will burn us all alive. In the memory of those who died, let's fight for that. Since my discovery of a great Jarrell poem earlier this month, I've been reading a lot more Jarrell -- and liking a lot of it. I'd known who he was before of course (he's pretty famous, although moreso as a literary critic than as a poet), but I hadn't ever focused on his work. But I think he's fabulous. So here's not one, but two poems of his that I recently read for the first time. At the North Pole . . . I reached my North and it had meaning. In an earlier installment in Attempts' Accidental Poetry Month™, I extolled the virtues of linguist A. Z. Foreman's site Poems Found in Translation, and included his version of a poem by Classical Chinese poet Li Bai, "Thoughts on a Quiet Night". Here's another translation of his, this time from the Arabic, by a Syrian poet named Nizar Qabbani (of whom I'd not previously heard). Here's the translation; click through to his site for the original (both written and in an audio file, read by Foreman himself). As only you can make me. And let me find my inspiration. And give me words again. -- Nizar Qabbani; translated by A.Z. Foreman. I think you could make a decent case for this poem's being misogynistic -- or, if not that, then at least presenting a very undesirable politics. (I'm thinking primarily of line 10 here.) But it's also, to my ears, a great poem -- a poems' politics having little to do with a poems' quality -- alas, and thank God. Willis Barnstone is, I think, most widely known as a prolific translator of poetry from various languages, including Spanish, Greek and Chinese. (Barnstone was friends with Borges, and not only translated some of Borges's poetry, but has also published a book about their friendship and a book of interviews with him.) So far as I can tell (as an amateur monoglot), he's quite a fine translator from all of those languages. But he's also a formidable poet in his own right. His most famous book of poems, I believe, is his collection The Secret Reader: 501 Sonnets, which is composed (just as the title says) of 501 sonnets of Barnstone's own authorship, plus (belying the title somewhat) another two-dozen-plus translations he did of others' poems used as epigraphs to various sections of the book (many but not unanimously sonnets; these are mainly from the Spanish, Greek and Chinese but also include poems from other languages, including Hebrew (Judah Ha-Levi), French (Louis Labé) and German (Rilke)). I've browsed rather than read through The Secret Reader, and I'd say that its quality is variable; but overall I like it a lot, and think it's well worth getting ahold of. or cold inferno of the previous wait. alive with secret words. Then blackly free. For the other 500, see his book. Centos -- poems composed by quoting lines from previously existing poems -- have been mentioned on this blog before; in the latter case, I did what I propose to do here, and cited sources for all the lines from one of my favorite centos. (The word is pronounced with a soft c, incidentally -- 'sento'.) This cento is by R. S. Gwynn (what a marvelously voweless* name! ); I found it on p. 68-69 of the anthology Rebel Angels: 25 Poets of the New Formalism. Oddly, despite that book's having an index of forms, and including this cento, they don't list "cento" among the forms the book uses. Anyway, first just the cento, with no links, so you can just enjoy it as a poem (and personally I think it's a very good one). And somewhat of a sad perplexity. An aged man is but a paltry thing. And strictly meditate the thankless muse. It gathers to a greatness, like the ooze. Percy Bysshe Shelly, "Ode to the West Wind"
John Donne, "Elegie: His Picture"
Theodore Roethke, "In a Dark Time"
John Keats, "When I have fears that I may cease to be"
John Crowe Ransom, "Piazza Piece"
Alfred Lord Tennyson, "Break, Break, Break"
William Shakespeare, Richard II, 3:2. I suppose that just reading the 26 poems quoted in that one poem would be a pretty decent syllabus for an introduction to English poetry. (Not a perfect one, to be sure -- I note, just as a fer'instance, that there isn't a single female poet on the list). Most are very famous -- several are among the most famous poems in the language -- although in a number of cases (Donne, Roethke, Ransom, Hardy, Robinson) I hadn't heard of that particular poem previously, although I knew other poems by all of them (indeed, many poems fairly well in some cases). Rupert Brooke I don't think I'd ever heard of at all. • Gwynn uses lines by 20 poets. He takes three lines each from Tennyson (from three separate poems) and Keats (two lines from one poem, one from another); he uses two lines each from Stevens, Wordsworth, Shakespeare and Milton (in the first three cases, from two separate poems; in the final case, two lines from one poem). That's half the poem. The other fourteen lines come from fourteen different writers. • I'm curious about whether all these poems are really in the Norton Anthology of Poetry (do they include speeches from Shakespeare's plays, for instance? ), but not curious enough to check. Finally, a word about the poem overall. I said above that I thought that Gwynn's was a very good poem in its own right. A cynic might note that of course it was a good poem: he stole from 26 of the best poems in the language! And there's some truth in that, I suppose. But of course he didn't just pick lines higglety-pigglety. He put them in an order that made sense -- a new (and interesting and aesthetically powerful) sense that none of the original poems had. And he did so in a way that followed his own aesthetic form (alternating quatrains, quoth the back-matter of Rebel Angels). So while he may not have written any of the lines, he definitely wrote the poem -- which is to say, he created its structure and its meaning. All this is just to defend collage as a genuine artistic practice, which despite its obvious validity in power is somehow always needs redoing. ** But as Montaigne said, there have been a great many centos, including "some very ingenious ones". And there have been many equally so since Montaigne wrote; among which I'd number this poem of R. S. Gwynn's creation. * Yes, I know 'y' counts as a vowel. ** I grant this is an odd way to put it, since the cento is an ancient form, while collage was invented by Picasso. But for all cento's age, it remains an obscure practice; while collage is done, I'd guess, in every preschool in America. Americans will tolerate a lot of casualties in a humanitarian war, just so long as none of them are ours. The two responses to this observation are to say that America should be more willing to suffer casualties of our own in a humanitarian cause, and to say that America should be less willing to cause casualties of others even in a purportedly humanitarian cause. Count me in the latter camp. You can pass your eyes over a Robert Frost poem pretty easily, but it takes a lot of focus and concentration to really read it. Here's one which I've passed my eyes over many times over many years. Two recent posts each referenced to (different) poetry anthologies by John Hollander, who I also knew as the author of the classic work Rhyme's Reason: a Guide to English Verse. This serendipity made me wonder about Hollander's own poetry which (grading still undone) I went and read some of. I like him -- I think I may come to like him a lot, although far from having come to any considered judgment, I'm still processing my first impression. But as part of Attemps's Accidental Poetry Month™ I thought I'd share my favorite of his poems so far. The poem I've selected is from Hollander's 1983 collection Powers of Thirteen, which won him the Bollingen prize and which was included in its entirety (unlike his other books, which were selected from) in his 1992 Selected Poems, so it seems like at least some people (including, presumably, Hollander himself (assuming he selected the selections in Selected P)) think it's representative of his best work. Powers of Thirteen is, by the sound of it (so far I've only read a few selections I've found online) a rather Oulipian work. * It consists of 169 (13 squared) poems, each of 13 lines, with 13 syllables in each line. I can't (yet) comment on the success (or otherwise) of the whole, but the following poem (which may or may not be titled An Old Song -- the online source I've found is ambiguous on this), which is the 29th poem in the series, is quite wonderful. Start, a lost cause. All our states and I are one in this. Rang with hilarity until we trembled with cold. There are a limited number of poems that seem to me to say something genuinely insightful about America; but this is, I think (again, I'm still assimilating it) one of them. I hope to get ahold of Hollander's Selected Poems in the near future; if so, I'll share further thoughts (and, probably, further poems) then. * The Oulipo is a French literary group that studies and promotes the notion of literary constraint; any poetic form, whether old like a sonnet or new like Hollander's 13s, counts -- and the fact that the work contains 169 such poems makes it doubly (squaredly?) so. One of my very favorite poems is W. H. Auden's Musée des Beaux Arts (link to my earlier posting of it). The other day, however, while procrastinating on some grading perusing a book review by John Crowley I saw his reference to John Hollander's awesome-sounding anthology The Gazer's Spirit: Poems Speaking to Silent Works of Art, which contains poems, reproductions of artworks they're about, and Hollander's commentary on the twain. (Incidentally, the term for Hollander's subject -- namely, "written descriptions, in prose or verse, of works of art" -- is "ekphrasis", as Crowley mentions in his review.) One of my first questions was whether he discussed Auden's poem, so I went onto google books to look at it. Then I proceeded to read Hollander's discussion of Auden's' poem -- and yes, of course, he did include and discuss it. In his discussion he referred to a rebuttal poem (my term, not his) to Auden's poem written by Randall Jerrrell. (Hollander also referenced Williams Carlos Williams's poem about the same painting by Brueghel, and affirmed my sense that it just wasn't in the same league as Auden's.) I found Jarrell's poem online and read it, and it's fabulous. So I thought I'd reproduce it here, as part of Attempts' ongoing Accidental Poetry Month™. It doesn't erase my admiration for Auden's poem, of course -- but it does comment very powerfully, perhaps even inescapably, on it: I'm not sure, not so early, but I wonder if it isn't one of those later literary works which forever change our reading of an earlier one. Damn you, Jarrell! I love that poem. The only excuse for you is that your poem is really amazing to. Here it is. But do go read or reread Auden's poem before you read this one, since it really is quite a direct commentary. As the sufferers watch the sufferer. The flame of one torch is the only light. Revealing, accepting, what she does not understand. Her hands say: "Lo! Behold!" Are put together in the work of mourning. Piercing the side of Christ, nailed on his cross. Thin blood, mixed with water, trickles from their sides. That gasps, "My God, my God, why hast Thou forsaken me?" They watch, they are, the one thing in the world. Shining baby, like the needle of a compass. In the salvation of the natural world. On its small, helpless, human center. What is important, see that it is not important. The earth is a planet among galaxies. Is the small radioactive planet men called Earth. -- because my head has been elsewhere. I have a lot of posts in the pipeline for the next week: none on current events. 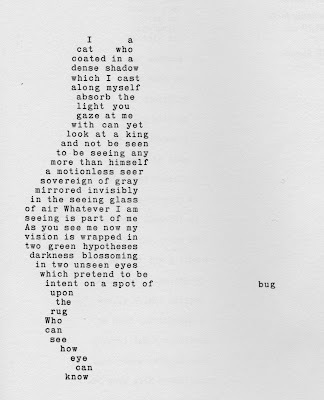 (All on poetry, actually: it's Accidental Poetry Month™ here at Attempts!) Which is perhaps all the excuse I need to link to this beautiful, anguished meditation of Chris Floyd's on living in a world that invites political despair, yet which has so much beauty in other areas. That's not precisely why I've not been writing about politics -- but it's not entirely disconnected, either. But somehow the internal dybbuk of keeping-current is whispering in my ear loudly enough that I'm just going to say one or two things -- in part about why I'm not saying anything. There will be no links for a lot of this stuff because you've already seen it -- or can do so just as easily as I can link. 1) The revolution in Egypt was one of the most thrilling and positive events in recent history, and one that will likely be remembered for years; the devastation in Japan was one of the most horrific and negative likewise. I have been riveted by both, with opposite but equally strong emotions. But I've posted on neither because I having nothing to say on either except that, in the case of Egypt, I am delighted, and Japan, horrified -- that is, the obvious felt by everyone of good will. 2) I wish we weren't going to war in a third Middle Eastern country -- although it seems we are. 2a) It's particularly depressing because the person initiating the war was the one I voted for in no small part because he'd opposed the last war. More fool I. 3) Of course Congress needs to declare war if we're going to attack Libya. This is utterly obvious. (Candidate Obama said so, just to name one relevant person.) If Obama attacks Libya without Congressional approval, it will be an impeachable offense so far as I can see. 4) Of course, Obama already belongs next to Bush at the Hague, on trial for the war crime of torture; in Obama's case, he's doing it against an American citizen who has not been convicted of any crime -- and who's crime, whistleblowing, was praised by candidate Obama back when he was trying to win my vote. The normalization of torture in this country is one of the truly horrifying things of the past few years -- and Obama, who I had hoped would push back against it, has instead ratified it as part of the normal political consensus. 5) Oh, and by the way we're still burning down the house of our planet. ...back to poetry tomorrow morning. See how whatever I do this March it comes back to poetry? Accidental Poetry Month™ continues! Back to politics free poetry tomorrow. Anyone who's been coming by Attempts regularly may have noticed that I've been putting up a lot of poetry this month -- seven entries under the Poems (Entire) tag so far in March (not to mention three last February too). There is, as usual, no particular reason for this -- I happened to come across a bunch of poems I liked and wanted to share, so I put 'em up. Now, in most cases there was an occasion of sorts: I put up a poem by Wendy Cope in connection with a related poem my students were reading for my class, and a poem by Seamus Heaney for St. Patrick's Day; the multiple translation of Li Bai's poem was occasioned by my finding and recommending a new poetry site*; and the poems by Robert Frost and George Eliot both related to quotations that I have long loved. The poem by Richard Wilbur I... discovered and liked. Okay, no occasion there. But even if there were motivations in most cases, the coincidence of this being such a poetry-heavy month here has been just that, a coincidence. So far as I know. However, I've decided to go with it, and declare March to be Accidental Poetry Month™ here at Attempts, and put up a bunch more poems and poetry-related program activities, because... I found a bunch more I wanted to post, so why not? ...which is online at the site of the Academy of American Poets: the link goes to his introduction, which is followed by the list of 100 poems with links to each. It's a fun list, I think. I like memorizing poetry, and looking over the list there are ten poems on it I've memorized in their entirety, and another dozen or more that I have significant chunks of. (I often, irritatingly, will find I know most of a poem but be unable to get a few lines straight.) Even if you're not particularly interested in memorizing poetry per se, it's a good little anthology of poems, largely fairly short (for the obvious reason), the longest one being Tennyson's Ulysses, (which is a favorite of mine and one of those that I've got about half memorized), clocking in at 73 lines. The rest are shorter, mostly considerably so -- a lot of sonnets, for the obvious reason. Hero and Leander is a Byzantine myth, relating the story of Hērō, a priestess of Aphrodite who dwelt in a tower in Sestos on the European side of the Dardanelles, and Leander, a young man from Abydos on the opposite side of the strait. Leander fell in love with Hero and would swim every night across the Hellespont to be with her. Hero would light a lamp at the top of her tower to guide his way. Succumbing to Leander's soft words, and to his argument that Aphrodite, as goddess of love, would scorn the worship of a virgin, Hero allowed him to make love to her. This routine lasted through the warm summer. But one stormy winter night, the waves tossed Leander in the sea and the breezes blew out Hero's light, and Leander lost his way, and was drowned. Hero threw herself from the tower in grief and died as well. Wikipedia also notes that the myth is the subject of two far more famous (and much longer) poems, by Christopher Marlowe (which contains the famous line "Who ever loved, that loved not at first sight? "****) and a later one by Leigh Hunt (which so far as I know contains no particularly famous lines). Not a bad little poem, as even Hollander recognizes; in fact, he gives a little half-sentence reading of it, which hits the high points, noting "its invocation of the four elements and its interplay of 'both' and 'one'". But if you want some longer poems to memorize -- or just read -- check out Hollander's anthology. And check back here in a day or two, as Attemps' Accidental Poetry Month™ continues!! * New to me, anyway. ** A deliberate irony on his part? Or unnoticed? I have no idea. **** Is that a rhetorical question? Because if not, I can think of a few examples. Brief historical background: the Croppies were the rebels during the 1798 Irish Rebellion. Vinegar Hill was the site of a battle in which the Croppies were badly defeated; the dead were thrown in unmarked mass graves. Update: In case you're curious, here's a link to last year's St. Patrick's Day poem. I first read the line "If I slack my hands, I rob God: for God cannot make Stradivarius violins without Stradivarius" quoted, just like that, in a book when I was a child -- some book of plays for children, I think, which quoted it in its preface. But perhaps I misremember. At any rate, I quoted it that way for years, until, at a party, a graduate student writing his dissertation on Stradivarius gently informed me that Stradivarius left very little writing, that he'd read it all, and that that line is not among them. (He was kind enough to suggest perhaps there was a source he didn't know, hence gentle; but it was clear that I was wrong.) I mentioned this to a group of friends at college, and one did the obvious thing, that I had never thought of, and looked it up in Bartlet's. It's dialogue put in Stradivarius's mouth by George Eliot, writing well over a century after his death. (I mention this in part because (and you can see if you google it) it is still occasionally misattributed the line to Stradivarius. Here's the actual source -- which doesn't have the precise wording I remember so clearly, but near enough. Like them by delicate rectitude of use. For inspiration and high mastery. At labor on such perishable stuff. Called him a slave, a mill-horse, a machine. Naldo would tease him oft to tell his aims. "I like the gold - well, yes - but not for meals. Have hunger that can never feed on coin. Making it crooked where it should be straight? That winces at false work and loves the true." To purgatory none the less." Made violins, and made them of the best. God choosing me to help him. at fault for violins, thou absent?" He were at fault for Stradivari's work." "May be: they are different. Leaving a blank instead of violins. Without best men to help him. Without Antonio. Get thee to thy easel." The famous phrase "carpe diem" -- most often translated "seize the day" -- is, of course, from the Odes of Horace (1.11). In this fabulous poem, however, Robert Frost takes exception to that ancient advice. And seize the day of pleasure." Où que vostre vie finisse, elle y est toute. L'utilité du vivre n'est pas en l'espace, elle est en l'usage: tel a vescu long temps, qui a peu vescu: attendez vous y pendant que vous y estes. Il gist en vostre volonté, non au nombre des ans, que vous ayez assez vescu. Pensiez vous jamais n'arriver là, où vous alliez sans cesse? encore n'y a il chemin qui n'aye son issue. Et si la compagnie vous peut soulager: le monde ne va-il pas mesme train que vous allez? Wherever your life ends, it is all there. The advantage of living is not measured by length, but by use; some men have lived long, and lived little; attend to it while you are in it. It lies in your will, not in the number of years, for you to have lived enough. Did you think you would never arrive where you never ceased going? Yet there is no road but has its end. And if company can comfort you, does not the world keep pace with you?